Peaches in October? I know, I know, it’s almost as blasphemous as peaches in September, but as long as the stores continue to carry peaches, I’m going to buy them. Actually, I was pretty excited that I could still find peaches this late in the season, because I really wanted to re-make this recipe. One of the best things about this recipe is the versatility. Say its a blustery winter day in February and you’re craving a peach blueberry crisp. You can just as easily make this with frozen peaches and frozen blueberries as you could in the heart of summer with fresh fruits. 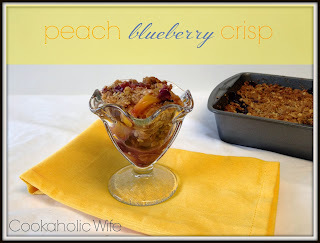 My initial recipe called for frozen, so I wanted to update this to include both options, depending on what time of year your peach blueberry crisp craving hit. I also took the opportunity to lighten this up a little bit by cutting some of the sugar and butter. You could opt for a whole wheat flour instead of all-purpose as well. 1. Preheat the oven to 375. Spray an 8×8 baking dish with non-stick cooking spray. 2. In a medium bowl combine oats, flour, sugar, cinnamon, nutmeg and salt. Then cut in the butter with your fingers or a pastry cutter until mixture is lumpy, but no pieces of butter remain. Set aside. 3. In a large bowl, toss the peaches and blueberries with sugar and vanilla. 4. Pour the peach-blueberry mixture into the prepared baking dish and then add the crisp mixture on top, spreading to cover the edges. 5. Bake for 55 minutes or until bubbly and golden brown. Serve with vanilla ice cream, if desired. I found it’s actually quite difficult to take a pretty picture of a crisp, but I hope you’ll consider this an improvement. For Tom’s birthday next week his mom bought him a signed copy of Emeril’s 20-40-60 Fresh Foods Fast. We looked through the cookbook last night and we both liked all but about 3 recipes. I highly recommend this book. I’m even making 2 meals from it this week for dinners and its also where this dessert comes from. 1. Preheat the oven to 375. Grease an 8×8 baking dish with butter. 2. 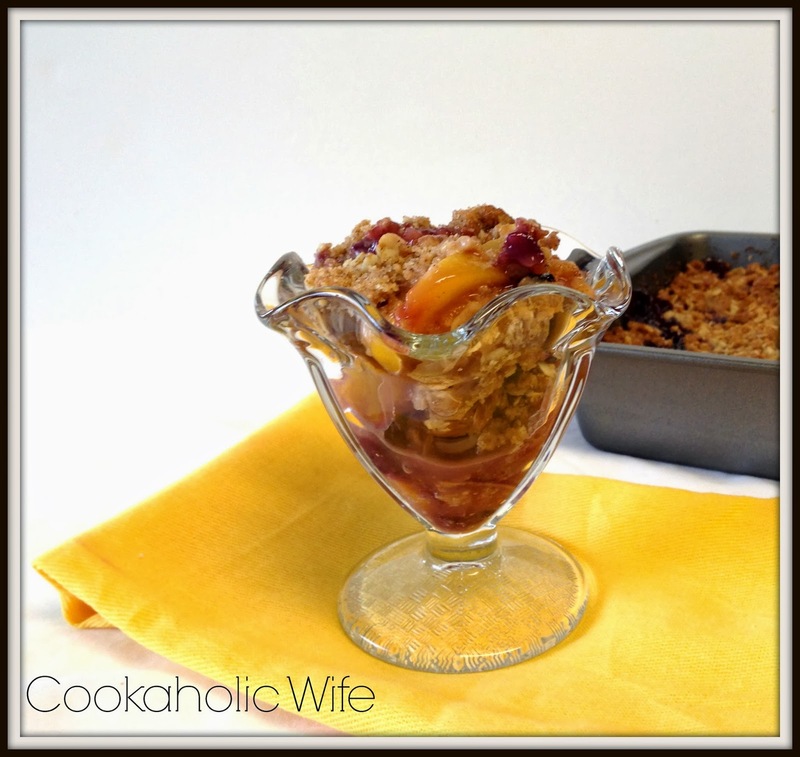 Combine the peaches, blueberries, sugar, flour, and vanilla extract in a large bowl. Toss well to mix. Transfer the fruit to the baking dish. Place the baking dish on a foil lined cookie sheet to catch any juices that might bubble over. 1. Combine all of the ingredients in a large bowl and using your fingers, cut the butter into the dry ingredients until the mixture resembles coarse crumbs. 2. Spread the crisp mixture on top of the fruit and bake until crisp is browned on top and the juices have thickened around the edges, about 55 minutes. 3. Serve with whipped cream or vanilla ice cream.